Home › Features › Doctor Diesel › Towing the line….. I first read Diesel Car back in the late eighties when I owned my first diesel, a CitroÎn BX estate, and I have owned only diesel cars since then. Within the next few months, I will be changing my 2012 Toyota RAV4 diesel for, I hope, something a bit more luxurious. I will be looking to buy either a Mercedes-Benz E-Class, a Jaguar XF, a BMW 5 series or a Volvo V70 D4, all of which will be estate cars with automatic gearboxes and, of course, diesel engines. Whilst I crave for an automatic gearbox car, I seek your advice because I tow a caravan weighing 1,374kgs when laden, and I wonder about the long term performance and reliability of the automatic gearboxes on any of these, or similar, as a result of this usage. I will be looking at one to two year old examples of these vehicles, and I hope to keep my choice for roughly six or seven years. My annual mileage should be around 12,000 miles, with about 3,000 maximum whilst towing. I am an experienced tower of caravans, but I have only ever towed with manual transmission vehicles, although I have driven automatic cars and trucks in my forty years of driving experience. People that I have spoken to who tow with these, or other automatics, tell me that they are great tow cars and that I should have no qualms in purchasing any one of the above. What do you think? Great to hear from a loyal long-time reader. An interesting challenge! It seems that you are shunning a “Chelsea Tractor”, which I guess may present an image problem for you, but there’s much to be said for some of these in the sense that the car and caravan combination would be more compact in length, and I’m wondering if the switch to something lower and longer like the conventional estates you have mentioned might come as something of a surprise after the RAV4. Do check out this aspect. But to keep things simple, I will ignore this alternative for the moment. If you do want to look at such alternatives then I’ll think afresh on that angle. For me, some of your possibles can be discarded for various reasons – or if not discarded, then you should bear my reservations in mind! Of course you will with many of the possibilities you are suggesting lose the benefits of four-wheel-drive, which may or may not be significant. But caravanning and moving ‘vans on greasy grass surfaces can bring significant problems with two-wheel-drive, and you may have forgotten the benefits of the 4WD of your present RAV4 (presuming it is a 4WD), for all the supposed benefits of traction control on two-wheel-drive vehicles. As regards to the automatic transmission, if you do the sensible thing and go for a sizeable five or six-cylinder engine with conventional torque converter transmission (maybe I should say traditional rather than conventional, as there are so many alternatives around today), and avoid CVT and twin-clutch transmissions, you will have nothing to worry about in terms of over-stressing the transmission. The Mercedes-Benz E-Class comes only in two-wheel-drive, and rear-wheel-drive at that. I’m a bit off Mercedes-Benz these days, to be frank, as they keep changing models and seem to have discarded the original image of solidity and quality for more style and less substance. Still, they are excellent engines, and good transmissions, but servicing can be very expensive. For all that, I could be easily tempted by an E 350 BlueTec, as might you! The Jaguar XF Sportbrake is again only 2WD and rear-wheel-drive. Highly rated as a tow car though, fine engines, and good torque converter automatic transmission. 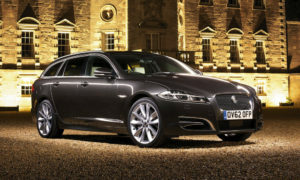 Of course the XF has just been replaced with a new car, so you would be looking at what will be an “old model”. The BMW 5-Series Touring is just the job in many ways – brilliant six-cylinder engines that are relatively economical, and fine transmissions. But rear-wheel-drive, too. I’m also rather shocked to find, on looking at Auto Trader, that 90 per cent plus of the used cars available are M Sport variants, the sporty suspension and hard ride of which puts me off a bit. A nice SE or Luxury would be the one for me, but remember that a new model is arriving next year! But I think a good local dealer is critical, and anything I have said above would be subject to this. It makes a huge difference to be greeted cheerily by sales staff and service people, and not treated as just another customer. Jaguar are certainly doing well in this area these days, BMW are possibly slipping a bit, Mercedes-Benz dealers can be very arrogant, whilst Volvo are rather variable, I think. To throw in something of a “bender” that may not have crossed your mind, you could take a look at the Lexus RX 450h hybrid, whose owner satisfaction ratings are unbelievably high. It would be interesting for you to look at one, anyway! You could also perhaps take a look at a Mazda CX-5, which is just about alright for your towing weight. I hope the above is of assistance, although I do realise that I’ve thrown in a few comments that may be somewhat controversial. Above all though, if you’re planning to keep the car for seven to eight years, don’t rush into it, and do demand decent, long test drives. If you come across cars with towing equipment already fitted, it could be a mixed blessing. It will save you some expense (some towing gear is very expensive, as you may know) but you won’t know what tackle the previous owner towed, and how he drove it.